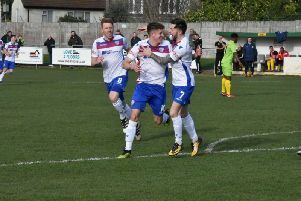 Andy Peaks believes his AFC Rushden & Diamonds players can “hold their heads high” after a frustrating opening week of the Evo-Stik South League Premier Division Central campaign. After starting the season with a 5-2 success over Redditch United, Diamonds have now suffered back-to-back defeats as a 1-0 loss at Biggleswade Town was followed by a 2-1 reverse at Stourbridge yesterday (Saturday). Diamonds got the perfect start as John Dean put them in front while Ben Heath also saved a first-half penalty from Luke Benbow. But Stourbridge levelled through Greg Mills and the hosts won it at the death when Leon Broadhurst’s header was adjudged to have crossed the line. And Peaks admitted it was a tough one to take for his team. “We were a bit unlucky to lose in the last seconds and it sums up a frustrating week for us,” the Diamonds boss said. “We got the three points last weekend and we probably got a bit of luck when we didn’t need it. “Then we have gone into two tough away games, we have played pretty well and got nothing out of them. “We aren’t a million miles away but it’s fine margins and we have to take the positives, even though the late defeat really does hurt. “We have given one of the better teams in the division a real game and we have done it without five players who would probably be strong contenders if they were available. “We are frustrated but we aren’t downhearted and I think the players can hold their heads high after the first week of the season. Diamonds boosted their ranks ahead of the game with Joel Gyasi returning to the club, Leon Lobjoit joining on a dual registration from Brackley Town and Oxford United youngster Albie Hopkins signing on a youth loan deal. Those moves were made after Ben Diamond and Tom Lorraine picked up injuries in the game at Biggleswade. And Peaks added: “It was good to have Joel back, we know what he is all about. “Leon is well known in the local area and we are glad to have him from Brackley and Albie is a big prospect at Oxford. Diamonds are back in action next Saturday when they head to Deeping Rangers in the preliminary round of the Emirates FA Cup.